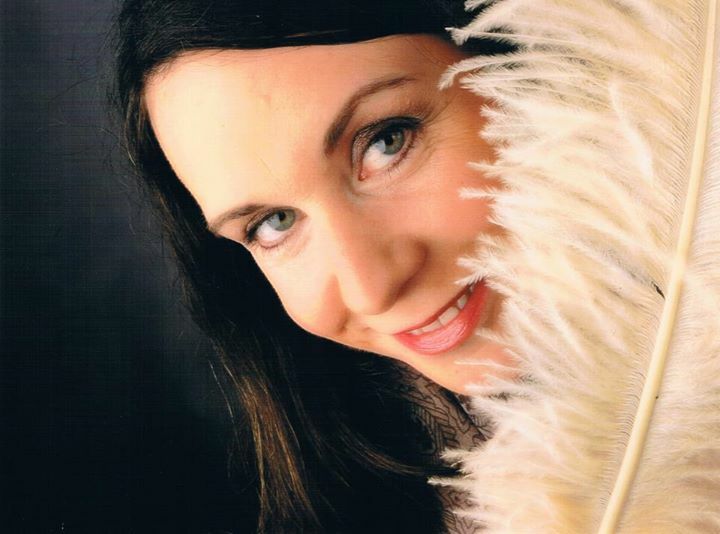 If someone tells you that you should check out Germany at Christmastime listen. Or just listen to me. Do it. Go. You'll love it. Every year, since moving to Germany, I've tried to visit new Christmas markets, some far and some near. 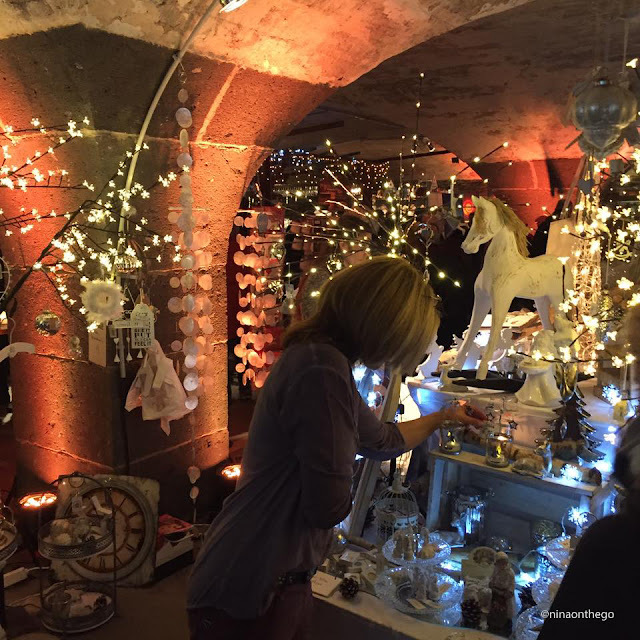 This December, I stuck closer to home...so here are 5 enchanting Christmas markets close to Frankfurt, that are my favourites. Let me start with Frankfurt. The city's historic centre, which is interesting at any time of year, comes to life when it's lit up with the warm ochre glow of twinkle lights. The central market is set up under the view of Frankfurt's 600-year-old city hall, the Römer. As is standard at most of Germany's Christmas markets, you will find ample mulled wine (glüwein) stands, potato pancakes and bratwurst kiosks, artisans selling wooden crafts, jewellery and an assortment of other gift items. But, you will also be able to experience specialty items...sometimes gourmet, sometimes whimsical, to either eat, drink or gift to someone you love. In Frankfurt, I stumbled across a Swiss fondue stand, smelling heavenly with the strong scent of Gruyere and Emmental simmering in huge bronze cauldrons. Served with large chunks of fresh sourdough bread, this was an unexpected Christmas treat! Just half an hour west of Frankfurt lies the elegant city of Wiesbaden. 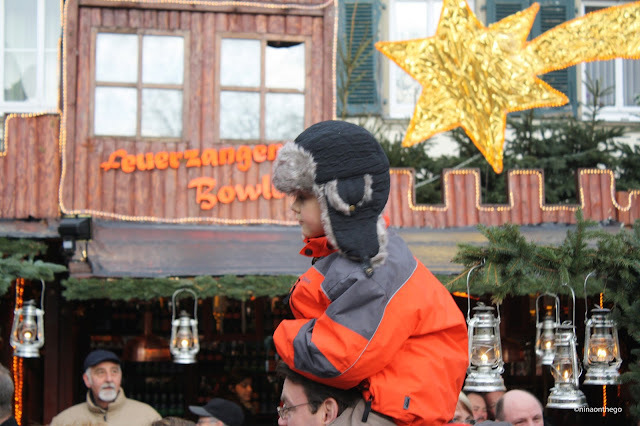 Their Christmas market is called the Sternschnuppenmarkt, which is sweetly translated into 'Shooting Star Market'. The state flower is the lily and huge lit blooms hover over the market stands, lighting the way each evening in December for friends to meet for an after-work glüwein. Many Christmas markets in Germany offer specialty glüwein mugs which easily turn into collector items. Sometimes medieval terracotta goblets, other times painted ceramics, in shapes of boots or St. Nicholas heads; each year these mugs, filled with steaming wine or cider, add an element of hygge to an already enchanting setting. I spent one Thursday evening with co-workers at the Wiesbaden Christmas market in the city's main square, and it was the perfect location to kick-off the season of peace, tranquility and friendship. 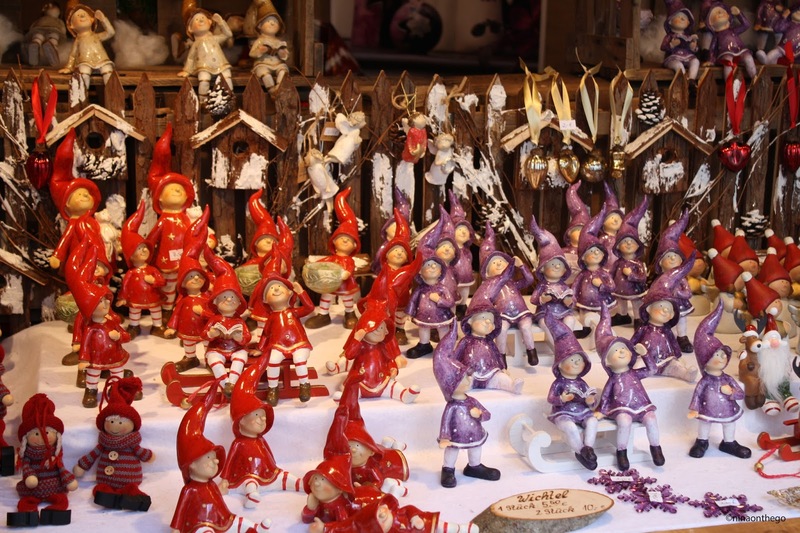 On the south banks of the Rhine River you will find one of my absolute favourite Christmas markets. Under the impressive Mainzer Dome cathedral, the market spreads across the centre square underneath a blanket of twinkle lights. This market is always packed full of parka-clad revellers come rain or shine because the setting just feels so magical. The people of Mainz LOVE their city, their football (soccer) team, their wine and their wurst. This is one of the two hubs of German carnival and the largest city (but still quite small) in Germany's largest wine region. The folk are proud and they celebrate their city almost every weekend with wine festivals of all shapes and sizes. Their Christmas market is no different. It is beloved. 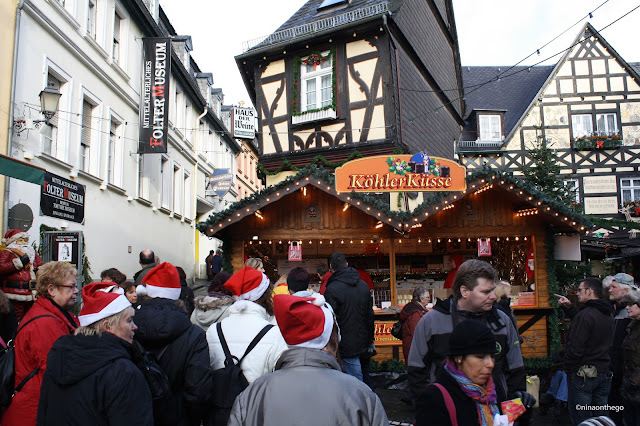 Just beyond the dome you will find the oldest parts of the city, with rows of half-timbered houses decorated with large bows, lights and mistletoe. The first time I visited Mainz, it was a week before Christmas, and there was powdered sugar-dusting of snow on the cobblestoned lanes of the Altstadt (old town). I remember telling my bf that I felt like I had walked onto the film set of a Christmas movie. It had seemed so surreal, so beautiful, and I had felt so blessed to be there at Christmas. Further down the Rhine, about an hour south-west of Frankfurt, nestled between the river and the hills of Germany's finest Riesling vineyards, is Rüdesheim. This is a town which is very popular with tourists. It is beyond cute...almost too cute. And it's Christmas market doesn't disappoint. Down the narrowest of cobbled lanes, the Drosselgasse is the star attraction of the town. 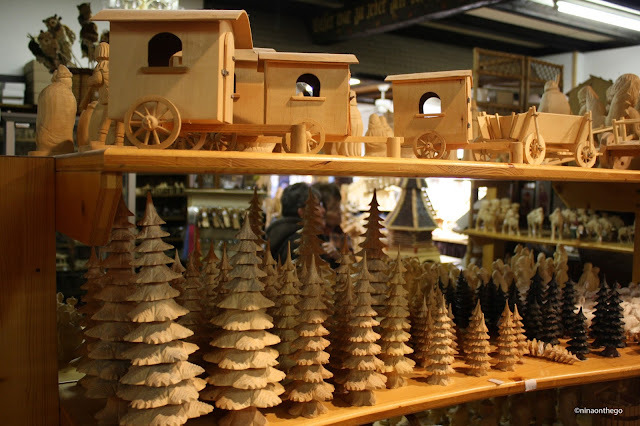 Authentic (and some not so quite) handcrafted Christmas ornaments and wooden nativity scenes line the gasse (lane) interchanged with wine taverns and quaint restaurants offering all the hearty German fare one can dream of. for all ages of child. If you're in Frankfurt and you have the time, I would highly suggest taking a day trip to the Moselle River. At any time of year this winding river valley is speckled with the quaintest, most lovely historic wine towns. But, at Christmas, these towns turn into a fairytale. On one of the looping twists of the river, amid terraced hills of lush grapes and castle ruins, is the tiny town of Bernkastel-Kues. In the small main square an advent calendar comes to life on the facade of the largest half-timbered building. Musicians play below, while visitors stop, stare, and take lots of pics. It's difficult to put into words how even the smallest details create a capricious feeling in the air. But if you want whimsy and magic, then the Moselle town of Traben-Trarbach is your place at Christmas. Another historic wine town, once one of the richest areas of Europe, dating back to the Roman Empire, this town does Christmas underground. Through a maze of connected wine cellars and caverns, long aisles of vaulted ceilings, some with antique wine casks, others with Christmas wares of handicrafts, wine or food, this is just another incredible Christmas market to get lost in. Wherever you find yourself this Christmas, whether in Germany or not, I wish you a peaceful, reflective and thankful season filled with love and family and, well, wine!